Its a little over a thousand miles away but not outside the realm of possibility. Hard to say where one will be in the next 2 years though, hopefully I can make plans for that one. They're relatively rare and cover such a small area that any given place on Earth is unlikely to receive one in a 100-year span. IIRC, I read somewhere that a given place can expect one totality every 370 years on average. The number of years between each time will vary a lot, of course. 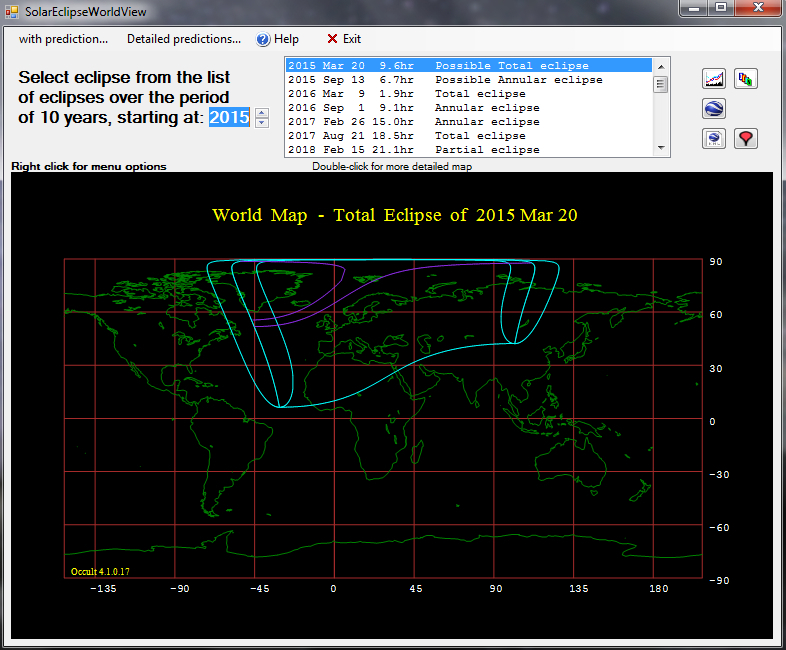 The next eclipse in Norway will be in 2061, but again only visible from Svalbard. 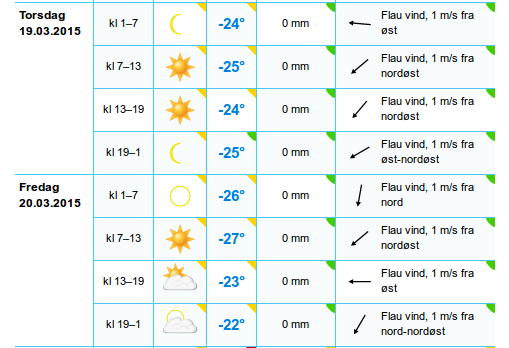 So only 46 years for Longyearbyen. 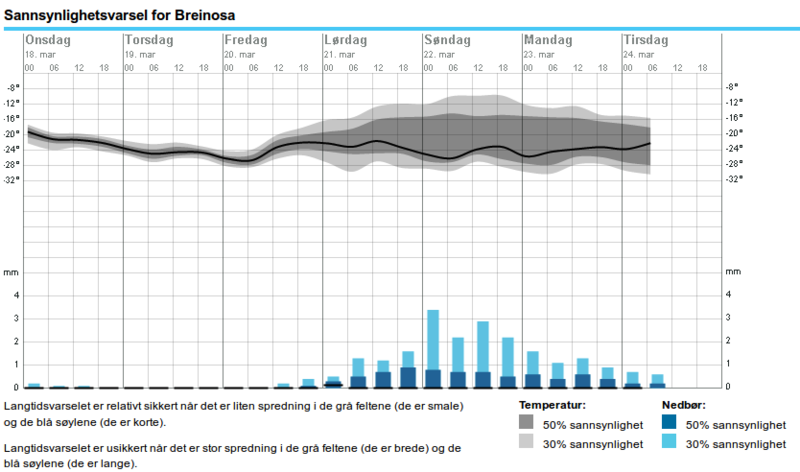 The weather forecast is still promising, but the 20th might have a change of weather. The inland end of the road still has the best forecast [updated]. The latest issue of local weekly newspaper Svalbardposten interviewed some 4 and 5 year old kids about the sun. The journalist asked whether they knew why the sun is gone for so long during the winter. The reply was a good one: "Perhaps because the sun doesn't like being here when it's so dark all the time!" This is currently the best place [accessible by road] to be according to the weather forecasts. 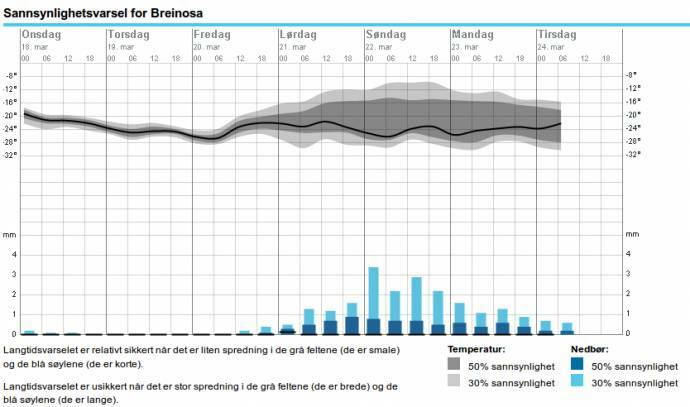 A bad storm (winds reaching 36 m/s) has just passed shutting down the airport and leaving large parts of the town without electricity last night, but from now the weather will only improve until the eclipse. My plan A is that the weather will be nice everywhere and I'll be relatively close to town. My current plan B is to drive to this place (a 25km drive or so). Same in Sweden, and SNOW! Midtskogen, good luck up there! Watsisname, can you give te name of the app used here? It seems quite useful. midtskogen, where did you find this data? Is it available worldwide? You can get worldwide weather forecasts on yr.no. 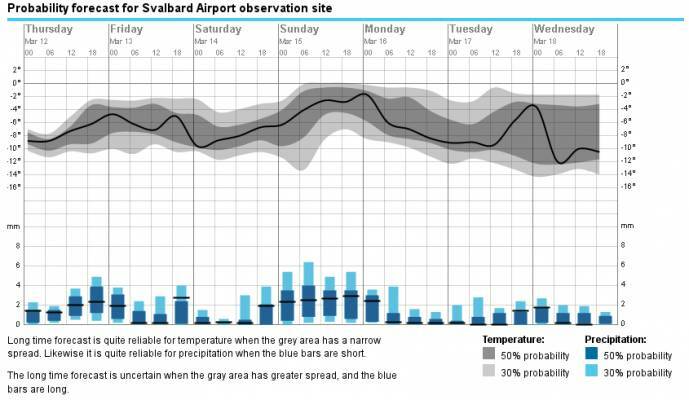 The accuracy is best for Norway (and Svalbard), though. Is there anyone at the North Pole who will study the eclipse from there? Must be spectacular seeng the sun just rising above the horizon being eclipsed. Sure, it's called Occult (for occultation predictions) and is available here. Pretty handy program. Be aware that some of the object catalogs are quite large (it'll tell you which ones they are), and so during the initial setup you may want to skip downloading them unless you have a very fast connection. I got a car so we have some mobility. How's the turnout? 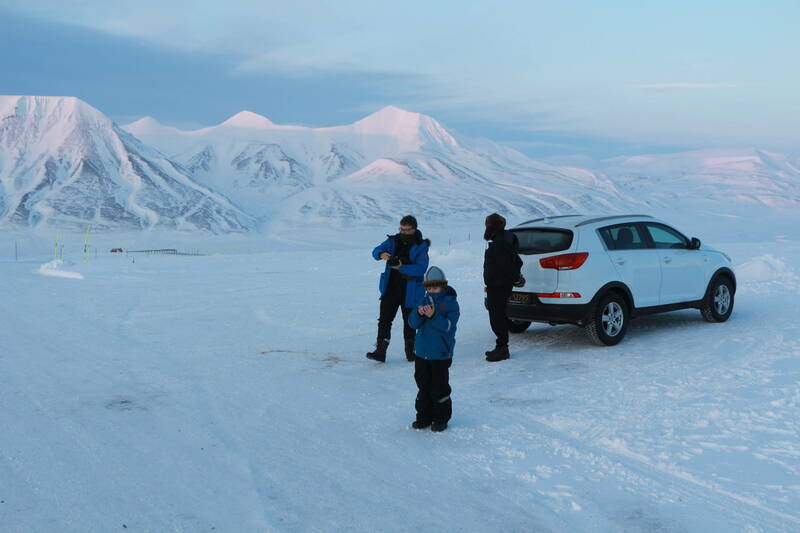 See a lot of other eclipse chasers in Longyearbyen? Also, a friend suggests to be alert for shadow bands during the few minutes before and after totality. They're one of the less commonly seen eclipse phenomena. You might be able to notice them on the side of your vehicle, or possibly on the ice itself. Lots of nerds here. There were warm-up lectures at the university building this evening with many prominent eclipse nerds. There were several hundred present in the auditorium, but the town's population of nearly 2000 is likely doubled now. Already at the airport in Oslo we saw an Italian group taking group pictures with their own eclipse expedition banner. But the streets here are surprisingly empty. Perhaps too cold. Some people also show up here pretty unprepared with insufficient clothing and without any place to sleep. Hopefully someone will accommodate them. All hotels were booked 8 years ago. We're staying in a private home. This morning a tourist was injured in a polar bear attack about 30 km from here. The bear was shot, injured and chased away and later killed by the police. They were camping and only had a trip wire, but no bear watch. We're luckily sleeping in a warm house in the town centre. And we have my father's German WWII rifle for the field tomorrow. 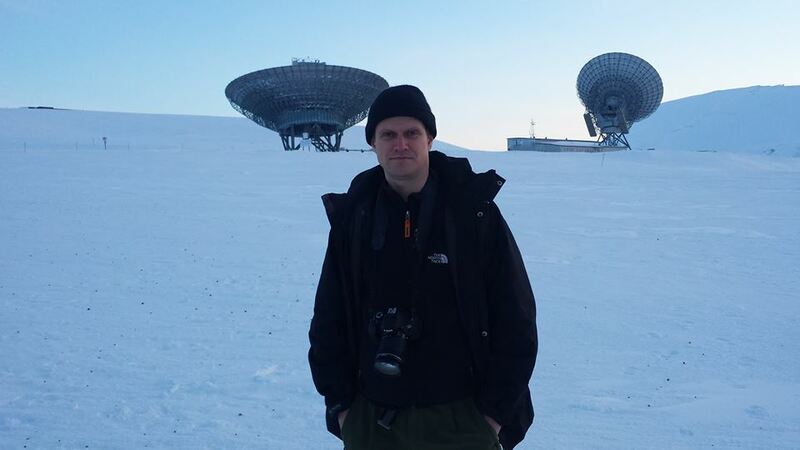 First contact in 5 minutes for Longyearbyen, totality in 65. Live feed is now up and it looks like a good view of the Sun.